Your child is avoiding their phone, laptop, or tablet. Any noticeable changes in a child’s behavior should put you on alert. If they suddenly stop playing games online, texting, or spending any time on the web, it may be cause for concern. Observe them to see if they seem nervous or uneasy when checking their phone or getting on the computer. Your child is suddenly spending significantly more time on their phone, laptop, or tablet. If your adolescent or teen seems to be consumed with their cell phone and begins retreating from social activities and time with the family, it’s important to find out what’s going on. Cyberbullying can involve harassment in the form of text messages, emails, and direct messages or posts on social media sites. If your child is spending a great deal of time on social networking sites or sending and receiving texts, it could be a red flag. Your child seems withdrawn and depressed, not wanting to engage in activities that they previously enjoyed. As a parent, you know your kids best. It shouldn’t be hard to sense if something just doesn’t seem right. Kids don’t suddenly change their mind about activities that they truly enjoyed, so if they announce that they want to quit their sports team, club, or other activity, it is cause for concern. When a child withdraws from the family and their friends, there’s a reason. Your child doesn’t want to go to school, or suddenly complains of frequent stomach pains, headaches, trouble sleeping, etc. All kids may try to get out a school day here and there, but if it’s becoming a point of contention, there’s a chance that your child is avoiding school because of bullying. Kids can be cyberbullied by classmates, which can mean that they’re being taunted both in the classroom and on the web. Their stress may start to manifest in the form of sleepless nights, stomach aches, headaches, and even unexplained weight loss. If you notice any of these warning signs with your child, you want to approach the subject calmly and gently. Kids who are being bullied, either in school or on the web, need their parent’s support, and they may feel embarrassed and ashamed of what’s happening. Take a look at your child’s recent online activity, including checking their profiles on social sites, for any clues about their situation. Children want to feel that they have their parent’s trust and compassion, so ask them if they would be willing to share what they’re experiencing with you. Never ignore sudden changes in your child’s behavior or appearance. 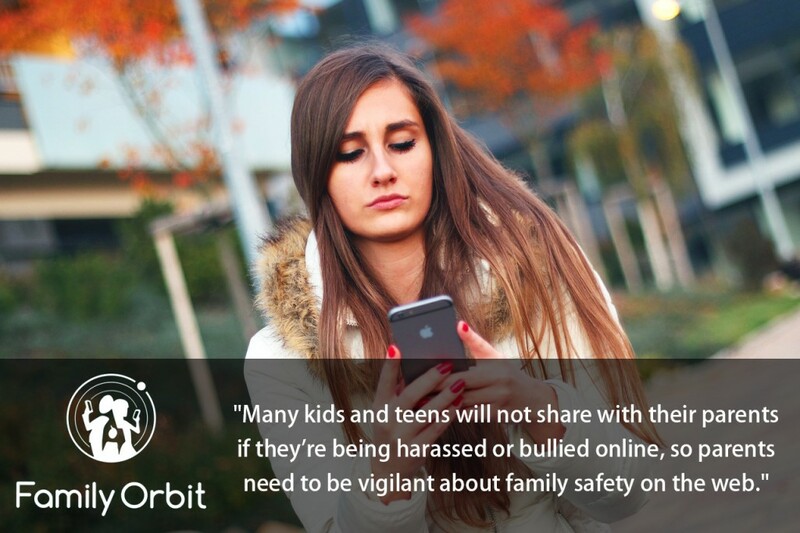 As a parent, family safety is your priority, and you always need to be on the lookout for the signs that your child may be the victim of cyberbullying.